Constructed of anodized steel, rubber wheels, and strong steel pins, the ABN Universal Boat Carrier has a 200-pound capacity and can carry any small water vessel. To protect your vessel from scratches or dents, this carrier includes oversized foam bumper pads. It also features a 12-foot nylon tie down strap and a spring-loaded kickstand for simple loading. Simply pop on the wheels with the snap lynch pin and strap in your water vessel in the center of the V-shaped cradle. It is a universal size - the inside tire to tire width is 16 inches, and the outside width is 22.5 inches. When not in use, the carrier folds together for storage. Stop hauling your vessel by dragging it around on damaging surfaces. 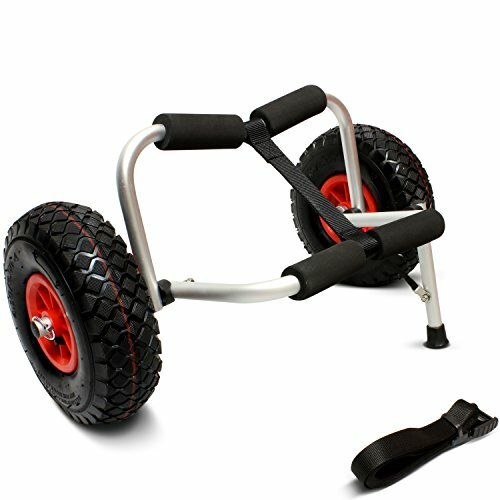 With this dolly, you can focus on what's important - getting onto the water hassle-free.